Our Quick Herbed Cheese Bread recipe is a must try! 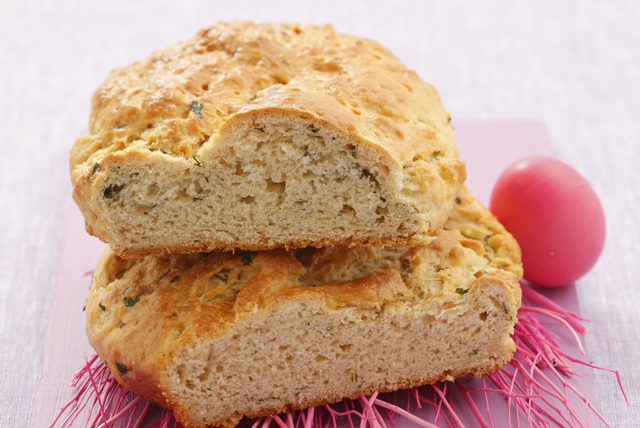 This tasty quick bread features fragrant fresh rosemary, thyme and Parmesan cheese. It's the perfect dish to serve as part of a weekend brunch, or as a side with hot soups or stews. Combine flour, baking powder, baking soda and salt in large bowl. Stir in cheese and herbs. Cut in butter until mixture resembles coarse crumbs. Make well in centre of flour mixture. Whisk egg and buttermilk until blended. Gradually add to flour mixture, stirring after each addition just until blended. Shape dough into ball with lightly floured hands; place on parchment-covered baking sheet. Pat into 9x6-inch oval shape. Bake 35 min. or until toothpick inserted in centre comes out clean. Cool on baking sheet 10 min. Transfer to wire rack; cool completely. Stir 1/3 cup chopped toasted walnuts or pine nuts into flour mixture along with the cheese and herbs. If you don't have buttermilk on hand, measure 2 tsp. Heinz Distilled White Vinegar into 1-cup liquid measuring cup. Add enough milk to measure 1 cup. Let stand 10 min. before using as directed.